Search and adopt a Manchester Terrier near you. Manchester Terriers are considered by most to be the oldest of terrier breeds, finding mention in works dating from as early as the 16th century. In 1570 Dr. Caius (Encyclopedia of Dogs) gives mention to the 'Black and Tan Terrier,' though he referred to a rougher coated, shorter legged dog than we are accustomed to. By the early 1800s a closer facsimile of the current Manchester Terrier had evolved. In The Dog in Health and Disease by J. A. Walsh a full chapter was devoted to this Terrier, for the first time recognizing it as an established breed. The description Walsh set forth might, in fact, serve well today: smooth haired, long tapering nose, narrow flat skull, eyes small and bright, chest rather deep than wide, only true color Black and Tan. This breed has maintained consistency in type and appearance for nearly two centuries (at the very least). The Kennel Club (UK) recognizes the Manchester Terrier in the Terrier Group and the closely related English Toy Terrier (Black and Tan) in the Toy Group. The Toy Manchester Terrier originally was recognized as a separate breed in 1938, bred down in size from the Manchester Terrier. The Toy Manchester Terrier weighs less than 12 pounds and has erect ears, never cropped. 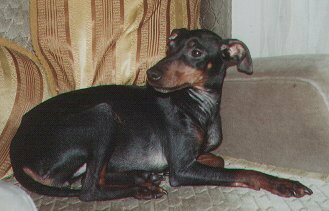 It is placed in the Toy Group by the Canadian Kennel Club and the American Kennel Club, though the Manchester Terrier is placed in the Terrier Group. The Manchester Terrier non-toy weighs 12 to 22 pounds and has 3 allowable ear types (naturally erect, button, or cropped). Other than size differences and ear type, the Manchester Terrier and the Toy Manchester Terrier have the same over all appearance. In the early 1800s there were times of poor sanitation in England. Rats soon became a health menace and rat hunting became a popular sport. John Hulme, enthusiastic devotee of the sport, crossed a Whippet with a cross-bred terrier to produce a tenacious, streamlined animal infinitely suited to the sport. (The Whippet influence may explain the unusual topline of the Manchester still required today). This cross-proved so successful that it was repeated, resulting in the establishment of a definite type— the Manchester Terrier was born. By 1827 the breed's fighting spirit had made it as handy along a hedgerow as in a rat-pit. The Manchester could tackle, with silent determination, an opponent two times its size. Ears were cropped to save from being torn in frequent scraps. (Also enhancing the sharp appearance of the expression). When rat hunting became illegal in England rat-pits were replaced by dining halls or public inns, all of which were infested by rats. To combat with the rodent problem each inn kept kennels. When the taprooms closed, who do you think took the command? The little Black and Tan rat killers who proved their worth one hundred-fold to the inn keepers. 1860 saw the Manchester district of England as the breed center for these "Rat Terriers". The name Manchester Terrier surfaced. Smaller specimens began to gain appeal. Unethical breeders were known to introduce Chihuahuas in order to reduce the size to as small as 2 1/2 pounds! This resulted in a number of problems, including apple heads, thinning coats, and poppy eyes. Inbreeding further diminished size and the smaller versions, though delicate and sickly remained popular for some time. Smaller Manchester’s were carried in specially designed leather pouches suspended from the belt, (earning the title of "Groom's Pocket Piece"). With their small stature these dogs obviously could not keep up with the hounds, but when the hounds ran the fox into dense thickets and they were not able to penetrate, the little Manchester Terrier was released. Nicknamed the "Gentleman's Terrier" yet this breed was never a "sissy." His dauntless spirit commanded respect. In its native country the Manchester gained quick acceptance as a recognized breed. In 1886 the first Black and Tan Terrier was registered in the AKC studbook. The next year "Lever" (AKC #7585) became the first AKC recognized Manchester Terrier. In 1923 the "Manchester Terrier Club of America" was recognized and in 1934 the Toy Black and Tan Terrier changed to Toy Manchester Terrier, in 1938 the "American Toy Manchester Terrier Club" was recognized. By 1952, the "Manchester Terrier Club of America" (Standards) was without organized breed representation. To the credit of the "American Toy Manchester Terrier Club", the two breeds were combined as one (with two varieties - Standard and Toy) with the formation of the "American Manchester Terrier Club" in 1958, an organization which still survives today.